Greetings to the ZAD Rigaer94 und Kadterschmiede verteidigen! 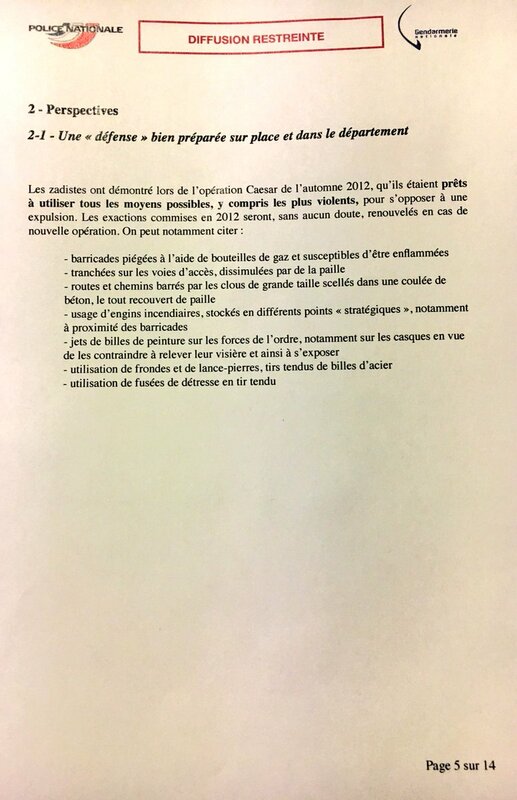 The structures that have grown in and around the Zone à défendre not only offer a rarely visible somewhat independent alternative to a life driven by financial questions and dominated by capitalist forces but a small but real threat to the state-supported organizational structure. 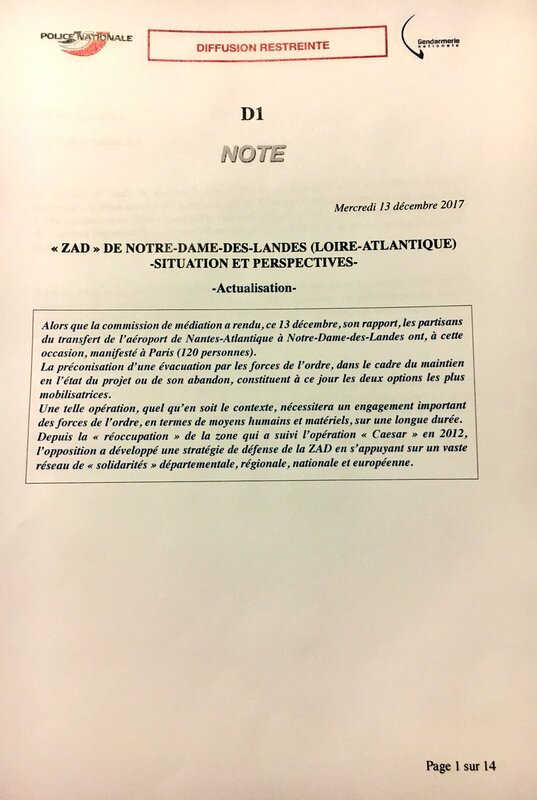 Fix points of reference and contact like a ZAD are important in a time were we need events like the G20 to mobilize broadly and physical escalation to reach more than our own small circles. We need practical experience with alternative structures when we dream of smashing the present measures of oppression and state structures. A Zad atleast can be a valid example for a local community and the problems encountered in a society based on those. Tactics and techniques need to be shared, tested, discussed; big protests, work in affinity groups and a periodic exchange on insurrectionary praxis can only reach so far in making them accessible, being approachable in every day life is important. While we try to do that in an urban context amidst peoples daily struggle and strong gentrification, more removed projects like the ZADs offer a somewhat accesible venue for people fed up with, or not bound to cities,on the road, looking for a new base, an exchange away from their usual surrounding and simply a meeting point for struggles not focused on the urban spheres and of course a pretty good location for diverse skillsharing and practice. When the dirty batons of the executive maggots of state/society will come down again in an attempt to reestablish their order and law in the ZAD not only is it an attack on all those longing for emancipation and autonomy but also a chance we should use to carry over the energy we found in Hamburg and show that we can take our own free spaces and furiously bash back atleast when threatened more directly. Our solidarity is with everyone in the ZAD. Don’t let anyone drive you apart! We will fight on your side! Lets make their fears ³ a reality and their projects a nightmare! ¹ Loudmouthed questions were thrown through traditional and social media. “Why would the Zadistes stay? Why should the state not evict them? Do they have guns? etc etc.. Odoxa an enterprise linked to the populist channels BFMTV and Itelé is presenting a biased survey. 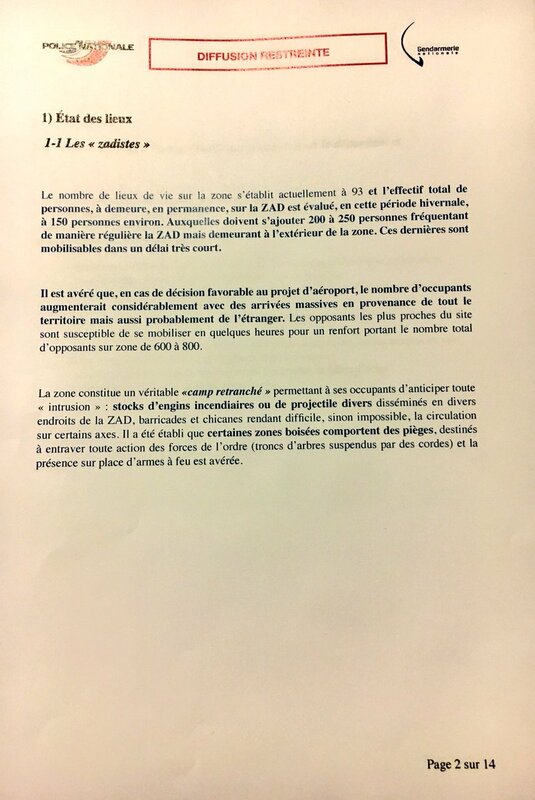 What’s being presented as every second french person (or 6 out of 10) is in favour of a violent eviction of the ZAD NDDL is really 56% out of a 1006 person sample in a very biased survey on feelings of insecurity and national security (Link 1, 2, 3). Journal du Dimanche ran a news article entitled “NDDL secret photos from the ZAD” with stolen out of context photos constructing a mythical weapons stach, trenches and tunnels, others relayed an SCRT (french press service) snippe that picked up JdD wording, stating that the presence of weapons is proven. Libération article with some explanations: here. Twitter thread by photo owner debunking fake news article on firearms at NDDL: here. A critical media overview and analysis on NDDL eviction propaganda: here. Documents that were supposedly for a briefing for the president have been leaked, atleast the first 3 pages are available: 1, 2, 3. These make it sound like the media’s made up articles might have come from this supposedly restricted police document.